Factory Pre-programmed data converter for oem applications. The 705 converter is programmed at the factory based on oem requirements. 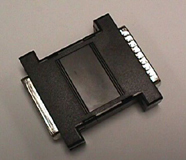 The converter chip inside of the 705 is also available separately as an oem product. The 705 has minimum order size requirements.